Why Don’t We Act Like Mary? You are at:Home»Featured»Why Don’t We Act Like Mary? Today is the Feast of the Assumption in the Roman Catholic Church, as well as the Dormition of the Theotokos (the falling asleep of the Mother of God) in the Eastern Catholic and Orthodox Churches. 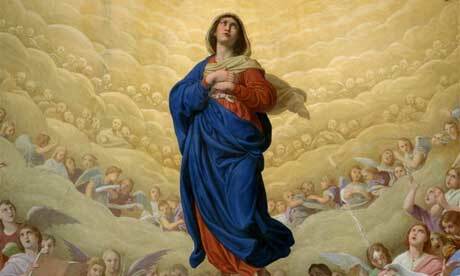 Much of the talk about the feast today will be centered on the theology and meaning of Mary’s bodily assumption into heaven after her death. While these explanations are necessary and noble, there is another way we can think about this feast – or any Marion feast really – that will bring the question of our own faith into a seriously challenging and deeply personal light. Simply put, a day like today gives us an opportunity to ask an important question: why don’t we act more like Mary? Or more to the point: why don’t I act more like Mary? You see, many of us can say we know the truth. We know that God is a Trinitarian God and that the Second Person of the Most Holy Trinity – Jesus the Christ – came to save us from our sins and offer us everlasting life. We know that the Third Person of the Most Holy Trinity –The Holy Spirit – is present everywhere in the world, interceding for us, comforting us, and leading us toward holiness. But even if we can say we know the truth, can we also say that we act on it like Mary did? Can we look deep within ourselves and honestly say that we can and do proclaim the same words that Mary has proclaimed for all generations? When I meditate on these words, I have to admit to myself that I do not think that my soul magnifies the Lord yet. I do not think that I am humble enough to see myself of low estate. I do not think I rejoice enough in what God has given to me (because I seem to be in a constant state of asking Him for more). And I do not think that I have come close to giving my entire body, soul, and spirit to God as Mary did 20 centuries ago. Why? Perhaps I seek my own comfort first. Perhaps I’m lazy. Perhaps my social ego precludes me from ‘offending’ people with the language and behavior of my faith? Perhaps my faith isn’t strong enough yet. Or, perhaps, it’s because I’m most deeply afraid of what God really has in store for me. Whatever the reason, I know I’m still not living as fully and radically for God as Mary did, and that makes me sad for me and for God. I love Him more than anything else and I should act more like it. To me, that means I must focus on three things: (1) spending as much of my life as possible in communal and personal worship of the one, true God, (2) living as materially simple as possible, and (3) offering as many spiritual and corporal works of mercy for as many people around me as possible. So, during this Year of Faith, as yourself this: am I living like Mary? If not, why not? Let us pray for one another that we can truly live our lives illumined by this kind of faith.